Ancient Stones - Lothian - 030 Standing Stone, Cammo, Edinburgh. This large single standing stones can be found in the grounds of Cammo Park, an estate managed by the local authority, just outside Edinburgh. 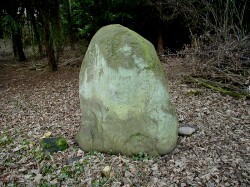 A large metal hook has been embedded in the stone and may indicate its use as a gate post. RCAHMS notes there are no bibliographic references associated with this stone. From the A92 Maybury Road, on the western outskirts of Edinburgh, take a minor road "Cammo Walk" leading to Cammo Park. A parking area has been provided for visitors to Cammo Park. The Cammo standing stone is one of the most massive I've seen while exploring the area for this web site. It's located within the grounds of Cammo estate, now in public hands, and is almost hidden by trees and shrubs. It's green coating of moss and lichen seems to conspire to keep it hidden from view, almost as if it's shy of being seen. There are no markings on the stone to give any of it's secrets away and what is purpose was, is a mystery.